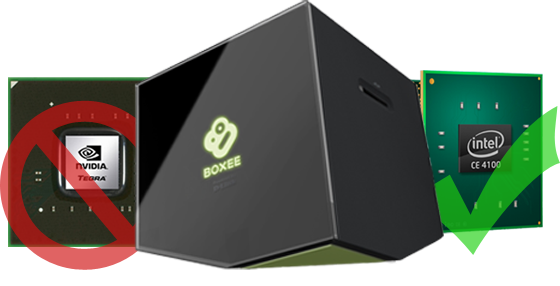 "The Boxee Box announced at the 2010 CES was based on the Tegra 2. In a post made on my personal blog right after the CES announcement, I had expressed my reservations on how it would be foolhardy to expect the same sort of performance from an app-processor based device as what one would expect from a dedicated media streamer or HTPC. Just as suspected, Boxee had to replace Tegra 2 with a much more powerful SoC. After evaluating many solutions, Boxee and D-Link decided to choose the Atom based Intel CE4100 for the Boxee Box." A great article on the Boxee Box and how the switch from NVIDIA's Tegra 2 chip to the Intel CE4100 will enable the Boxee Box to really deliver on a high-quality experience in terms of hardware-assisted playback of HD video content. Will the software measure up? My Magic 8 Ball says "It's looking likely". Let's hope that's the case!